Just this morning I sat down at my computer to make a SoundCloud playlist of some of my past releases and some more current material to send to a manager who wanted to get me in the room with one of his artists. What better way to make an introduction than through music. I agree. I used to drag an mp3 (or 2 or 3) into an email. But that’s so yesterday. Later, I used We-Transer. WT sends your stuff to someone who then downloads it. But when I get songs that need to be downloaded, I’m annoyed. Who wants even more stuff on their computer? Plus…for me… once I download it, where is it? I have 3 download folders. Don’t ask me why. I just want to click on that commitment free, user friendly link. Thank you, I guess. Isn’t this what songwriters want? Isn’t this what we ask for? For our copyrights to be protected? Ok…what to do. It’s my song. I swear I wrote it. I read further. But I don’t think I’d qualify. I wrote the song but Warner owns the master and that’s what I uploaded. The master. Besides, by the time I fill out all this paperwork and wait for approval, manager will move on to the next songstress. Yeeks. Why is everything so difficult? I also have difficulty opening things. Like any electronic device hermetically sealed inside that harder than life plastic packaging which can only be sliced open with an Exacto knife. Last week I bought some bionically packaged goat cheese from Trader Joes. I swear, I could not access the cheese. It remains unopened on a shelf in my fridge. I’ll toss it when the date expires. 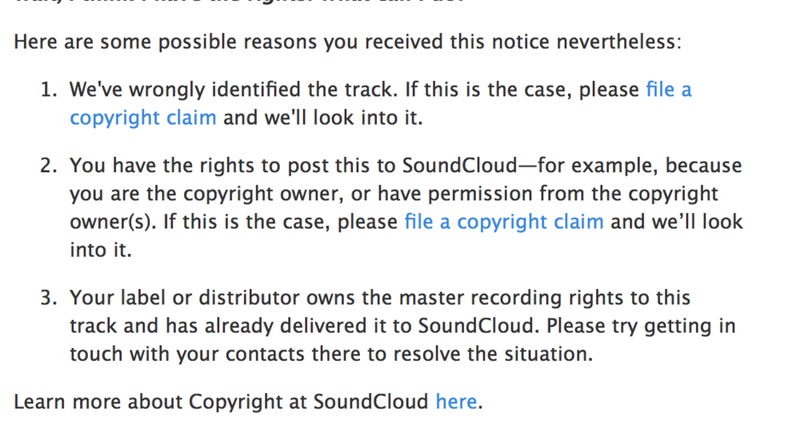 So…back to my SoundCloud playlist…there’s got to be a work-around. I know—I’ll rename the track. I’ll change the “doesn’t” to “dsnt.” They’ll never detect it was copyright protected. I’m SMART! I'm CLEVER! But that doesn’t work either. Sigh. Geez. You’re good, SoundCloud. I guess I’m not the first one to try that. What does a girl have to do to work in this town? So I thought…in the body of my email I can include a link to a couple of commercially released videos on YouTube… the same YouTube that pays Songwriters barely nothing…yet makes the aggregator of the ad that previews our song a wealthy entity. Of course, Lyor Cohen, Global Head of Music at Youtube, claims that YouTube pays out more than Spotify for Ad-Supported streams in the US. —If he’s not talking truth, there can be a lot of fun made of his name. If a link is private on SoundCloud and manager wants to forward it to his artist, she won’t be able to access it cuz her email addy isn’t on my list of allowable recipients. Oish. See what I mean? This is to my brain what that bionic packaging is to my hands. What does one do? I think I need a manager. But I don’t have time to find a manger. So the current state of my email…2 YouTube links, 2 attached mp3’s, no SoundCloud. There was a time when I sent a cassette in a padded Jiffy pack. Somehow that was easier. I didn’t have to think. Yesterday I drove a loaner car while mine was in the shop. I had to pull over to the side of the road to figure out how to listen to the radio. The system is supposed to be intuitive. It took me 20 minutes. I felt nostalgic for a simple on/off knob. But seriously, we can’t have it both ways…as creators…we have to abide by the rules for which we have been advocating. (Oh and also, if we stream music we have to subscribe to a service and pay for it. Otherwise we're perpetuating the idea that music has no value.) Understood. There just has to be an easy way to share material (released and unreleased together) on one link, professionally, streamlined, EASY. What am I missing? I’m open to suggestions. I have a feeling I’ll get some.